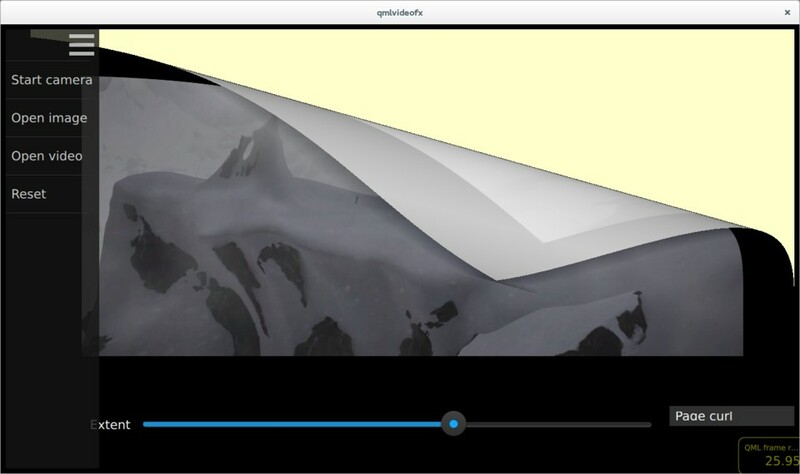 QML Video Shader Effects demonstrates how a ShaderEffect can be used to apply postprocessing effects, expressed in GLSL, to QML VideoOutput type. The following screenshots show shader effects being applied. 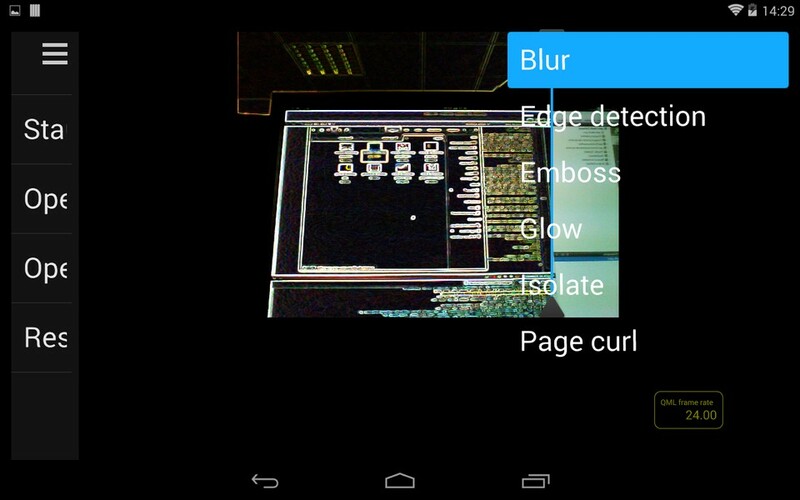 In each case, the effect is implemented using a fragment shader. 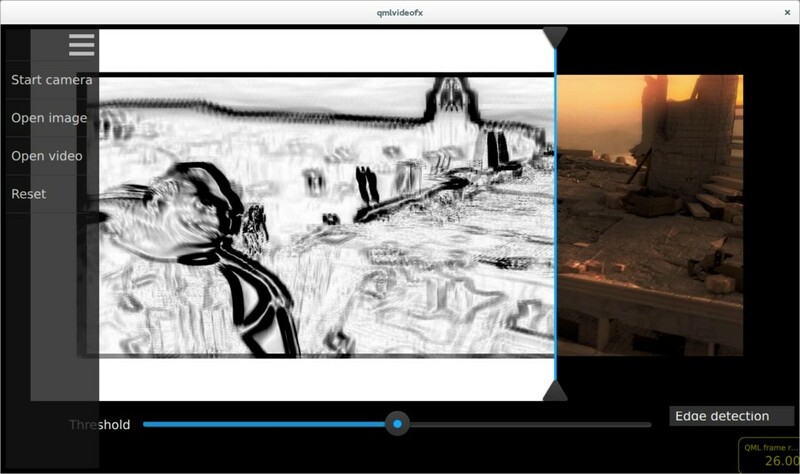 Here we see an edge detection algorithm being applied to a video clip (Sintel from blender.org). This image shows a page curl effect, applied to the same video clip. 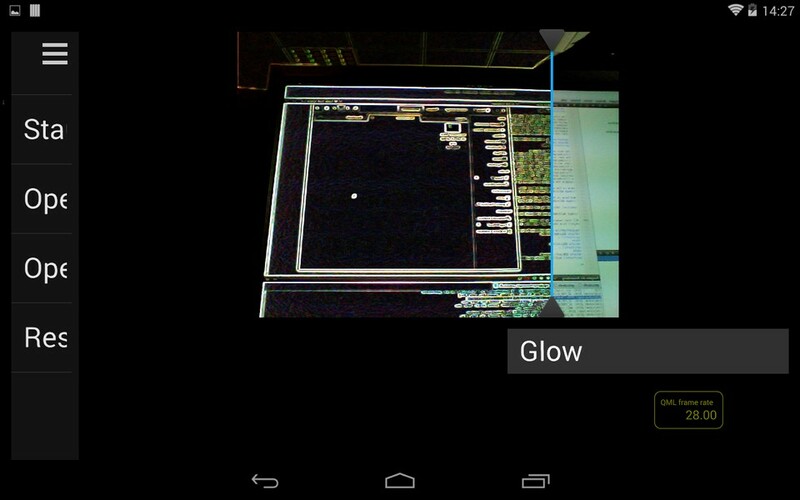 Here we see a 'glow' effect (edge detection plus colour quantization) being applied to the camera viewfinder. 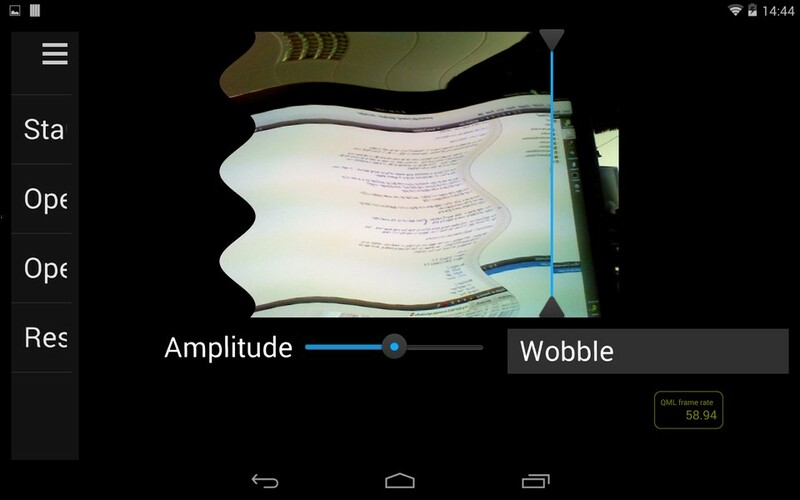 This image shows a 'wobble' effect applied to the viewfinder. The application includes many more effects than the ones shown here - look for Effect*.qml files in the list of files below to see the full range. The interface of Effect allows for derived effects to specify the number of parameters which they support (and therefore the number of sliders which should be displayed), and whether a vertical dividing line should be drawn between transformed and untransformed image regions. As an example, here is the implementation of the pixelation effect. As you can see, the pixelation effect supports one parameter (which controls the pixelation granularity), and states that the divider should be displayed. The main.qml file shows a FileOpen, which allows the user to select the input source and an EffectSelectionPanel item, which lists each of the available shader effects. As described above, a Content item is used to load the appropriate input and effect type. A Divider item draws the vertical dividing line, which can be dragged left / right by the user. Finally, a ParameterPanel item renders the sliders corresponding to each effect parameter.